Israel Arm­strong, the reluc­tant librar­ian in North­ern Ire­land is back for a new adven­ture. We have met Israel in the case of the miss­ing books, but now the books are all save and sound in the van aka the mobile library. 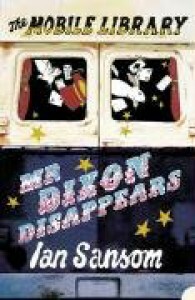 What (or bet­ter who) is miss­ing this time is Mr Dixon, an influ­en­tial depart­ment store owner. He van­ishes right under Israel’s nose and when Israel is found at the ‘crime scene’ he is even arrested as a sus­pect of harm­ing and kid­nap­ping Mr Dixon. This unjust treat­ment to make him the obvi­ous cul­prit makes Israel more deter­ment to catch the real offender. Well.…determent.…Israel has to find him really, oth­er­wise he him­self will end up in the jail cell again. So, another job for our ‘hero’. Just as the pre­vi­ous book, this story has enough pace and humor to keep you smil­ing through­out the whole book. An easy and fun read.